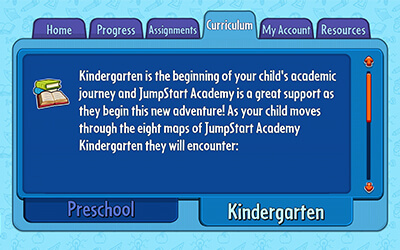 JumpStart Academy Kindergarten is an engaging and educationally-driven game for your kid. 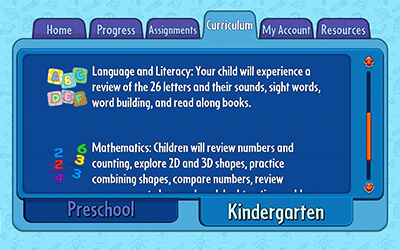 We combined an innovative world of gameplay driven by Common Core Curriculum standards to allow players to be immersed in concepts guaranteed to not just get them on grade level, but to push them beyond the boundaries of school standards. With stimulating lessons and captivating games, your kindergartner will be prepared to take on any challenge that comes their way. The letters of the alphabet and their sounds. Each of these standards are guaranteed to get your little learner above and beyond grade level. Kids grow fast, so it’s important to make sure their brains can keep up! JumpStart Academy Kindergarten will take your child through the essential Common Core standards every kindergartner needs to know before they reach first grade. With a system that focuses on where a player struggles and succeeds, the game informs you and realigns to make your young scholar a stronger student. From phonics to numbers to colors to operations, your child will be prepared to take on any challenges they may face in the academic world!